Now that you’ve studied Hamlet, you’ll notice all around you how often the play is alluded to in popular culture. To see some examples, you should visit this site. For class tomorrow you need to also read the essay “Hamlet: A Modern Perspective” by Michael Neill. If you have the Folger edition of the play, it’s in the book right after the play (p. 307-326). Otherwise, you should have picked up a photocopy after taking your Act V quiz. 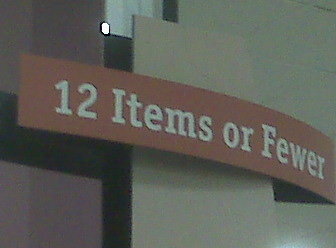 … too bad the next checkout aisle had a handwritten sign that said “12 items or less.” At least they got the permanent one right! Seniors (regular AND honors): Please read one of the following for either your 2/24 or 3/24 AR book. All can be found at the IHS Library Media Center and at the local branch of the CCPL. You can click on each title for more information about the individual books.